New 2013 VW Golf GTI revealed | What Car? 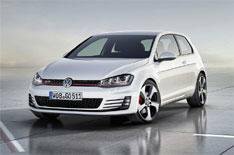 This is the new Volkswagen Golf GTI, which has just been unveiled at the Paris motor show. The car is powered by a 217bhp 2.0-litre turbocharged petrol engine, which is around 10bhp from the power available in the current GTI. VW says the new GTI is faster than the current model it has a top speed of 153mph, up from 149mph, and goes from 0-62mph in 6.6 seconds, down from 6.9 seconds. A Performance Pack is a factory-fitted option that boosts power to 227bhp. VW says the pack also enhances the car's handling, because it includes a differential that reduces understeer. It also comes with larger front brakes. The new GTI comes with a six-speed manual gearbox as standard, while a six-speed DSG gearbox is an option. Fitted with the manual box, the Golf GTI averages 47.1mpg, and emits 140g/km of CO2. An engine stop-start system comes as standard on both manual and DSG versions. As in the new Mark 7 VW Golf, which goes on sale early next year, the new GTI comes with new safety and infotainment systems. The Golf GTI comes with red brake calipers, a honeycomb grille with a double red stripe, and chrome twin exhaust tailpipes. The interior has the traditional Golf GTI tartan seats, as well as a flat-bottomed steering wheel, GTI golf ball gearknob and GTI red ambient lighting. While the car on show in Paris is billed as a concept car, expect the production version to be largely unchanged when it goes on sale later next year.